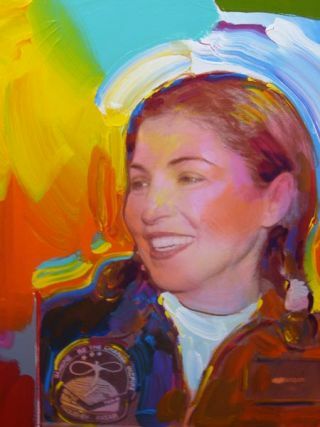 Portrait of Anousheh Ansari by artist Peter Max. The first female private space explorer, Anousheh Ansari, lit up a New York City Art Studio with her smiles, all 17 of them, earlier today. Famed pop artist, Peter Max [image], presented the cheery Ansari with 16 portraits of the entrepreneur, in all of which she is smiling. "Everyone told me you have a permanent smile tattooed on you face," Ansari said. "From the moment I arrived in Star City I was excited about what I was doing until the moment I landed. And no one could ever take that smile away from me." Ansari landed safely in Kazakhstan on September 28 after spending eight days aboard the International Space Station (ISS). She is the fourth person to visit ISS under a deal arranged by the Virginia-based space tourism firm Space Adventures with the Russian Federal Space Agency. Max first learned of Ansari's plans to go to space through a mutual friend. "I was like oh my God, I love her," Max said. "I adore what she's doing." The friend then asked Max if he was interested in painting her portrait [image]. To which the artist replied "in a heart beat." First it was going to be one portrait, Max told SPACE.com. "Then I painted four photographs, one of each. Then I said let me paint each one four times. I like to do quadrants, and this is what happened." The portraits [image], all oil on canvas, were painted in the artist's trademark pop expressionist style in a rainbow of hues. Each one shows the Iranian-born Ansari in either uniform or in her space suite, garb that she hopes to put on again. Ansari's company Prodea is also developing a suborbital spacecraft with Space Adventures. "I will definitely be one of the first passengers on the suborbital flight," Ansari told SPACE.com. "Once you're in space, you get sort of addicted to it. So any chance to have that similar experience again, I will definitely do it." The female explorer also plans to educate society about the importance of space exploration, with an emphasis on reaching out to young girls around the world. "I am going to try and continue my work and talk to as many people as possible and hope that I can take this flame and put it in a lot more hearts," Ansari said. As to what she'll do with Max's paintings, Ansari is not so sure. "I don't have any wall in my house that's big enough for this," she said. "Maybe I'll put it in a museum so it would have a good effect and more people can see them and get inspired. I really like it. I think it's great."